Today President Trump declared that transgender Americans would be banned from serving in the U.S. armed forces in any capacity. In a string of morning tweets, Trump characterized transgender service members as a burden and a disruption. Click here to speak out against President Trump’s latest anti-LGBTQ attack. The policy implications of the President’s tweets are unclear, but they come just days after the U.S. House rejected a discriminatory amendment that would strip crucial health coverage from transgender service members. As estimated 15,000 transgender troops currently serve in the military. The impact of the President’s words this morning go far beyond what can fit in a 140-character tweet. It’s about the transgender soldiers who are waking up this morning on the other side of the world – thousands of miles from their home and the people the love – reading a message from their Commander in Chief that their service to our country is a burden. President Trump insulted thousands of American heroes this morning—and reversed course on an open and inclusive policy long-supported by top leaders across the U.S. military. 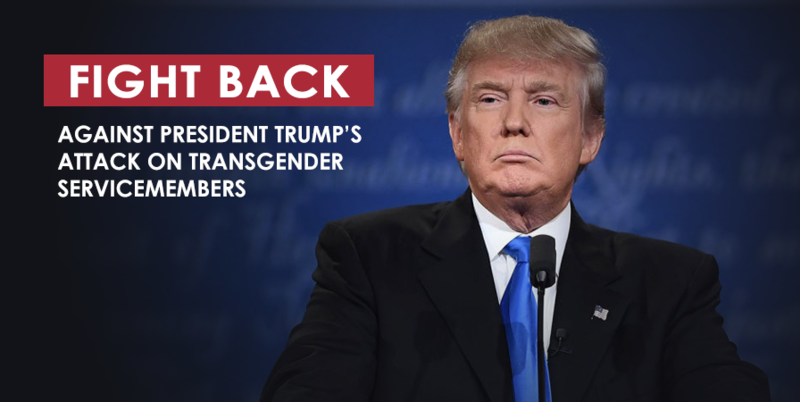 Let him know that so long as transgender Americans are under attack, we won’t back down. Tell President Trump: Let the military’s transgender-inclusive policy stand.